Ms Bass complimented the work of the student advisors in the Legal Advice Clinic for their work in assisting members of the public pro bono with free legal advice. She also highlighted the importance of hands on experience for law students in developing their legal skills, their understanding of the law, and the legal system. 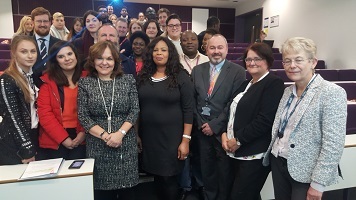 During her visit, Ms Bass was introduced by Dean of the Law School, Professor Craig Barker, and welcomed by President of the Student Law Society, Joy Johnson-Babatunde, as well as staff from the Legal Advice Clinic, Alan Russell and Sara Chandler. Ms Bass gave an inspirational account of her early years doing pro bono in the Florida Courts, including changing the law on gay adoption when acting for two children whose constitutional rights were violated because the state would not allow their long term foster parents, a gay couple, to adopt the children. The following evening Ms Bass gave the keynote speech at the Law Works Pro Bono Awards held at the Law Society, Chancery Lane. Sara Chandler met Hilarie Bass during the Opening of the Legal Year ceremonies in London. They both participated in a roundtable of women international bar leaders, covering equality, diversity, inclusion and social mobility. Sara said: "Hilarie became interested in LSBU during our discussions and in particular was interested to hear of the opportunities LSBU students have to get involved in experiential learning. As President of the ABA Hilarie is championing social mobility and pro bono during her year in office. Her aims are the same as ours, and LSBU provides many opportunities for pro bono by students under then supervision of LSBU solicitors and barristers especially in the Legal Advice Clinic. It was an honour that Hilarie accepted our invitation to meet LSBU students".